Snakes and other reptiles don’t hibernate; they brumate. Brumation in reptiles is quite different from hibernation in mammals. Reptiles do not sleep the winter away, nor do they live off their fat reserves. They are alert, though sluggish, and if it’s cold enough, they don’t even lose weight during the winter. How does this happen? Reptiles are cold-blooded, or more precisely, ectotherms. An ectotherm’s body temperature depends on its surroundings. When the weather is warm, its metabolism is high. When it cools down, its metabolism slows down. When a reptile brumates, its metabolism has slowed down so much that it hardly uses any energy over the entire winter. It doesn’t eat for months, but it doesn’t starve either. During this time, the need for food almost stops. In comparison, mammals live off their fat stores during hibernation. Bears that don’t fatten up before winter would be awfully skinny in the spring. But a reptile must do more than slow down its metabolism enough that it won’t starve. It must also avoid freezing to death. Snakes in Idaho and other cold places have to find a place deep enough to get below the frost line. These sites are called hibernaculums. Animal burrows, rock crevices, talus slopes, caves and leaf litter are a few examples of insulated hibernaculums a snake may use. Some brumating snakes don’t make it through the winter. The problem is that some winters are colder than others, and as a result, a hibernacula that was safe for years may suddenly be lethally cold. But, because brumating snakes are still active and conscious, they do have the option of going deeper as needed if they can. 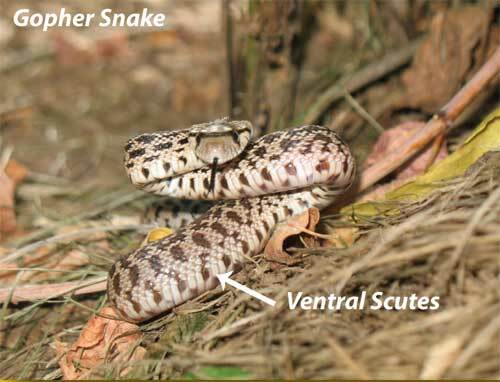 Most snakes have flattened scales on the underside of their bodies called ventral scutes. These scutes give snakes traction just like the tread on a tire. Snakes require a surface with obstructions and some roughness in order to travel. When a snake is travelling on loose sand, every part of its belly touches the ground and it flows along in a series of S-curves. On the back of each curve the sand gets pushed up. The body pivots and pushes sidewise against these piles of sand and is propelled forward. Can snakes travel as quickly on glass as they can on sand? Let’s find out. Put the board on a flat surface and place the sandpaper over the board. Put the wooden block in the middle of the board and lift one end until the block starts to slide. Measure how high you lifted the board. Place the wooden block in the middle of the mirror and lift one end until the block starts to slide. Measure how high you lifted the mirror. When you lifted the mirror or board ramp, you applied a gravitational force to the block. The glass or sand paper provided a resistive force, preventing the block from sliding. This resistive force is called traction. Which surface provided more traction for the block? So, can snakes travel as quickly on glass as they can on sand? ← Just how smart are ravens?